Tuesday, January 20, 2009, will be a historic day in the history of my nation. Although we have our share of shortcomings and faults, the United States of America continues to provide a good example for the world in periodically demonstrating the capability of a large and powerful nation to peacefully transfer power from one political party to another without violence or bloodshed. As we collectively watch these events unfold on our televisions, computer screens, and iPhones tomorrow, it will be interesting to also watch the photographic reports of citizen journalists including those submitting media to CNN’s iReport website. 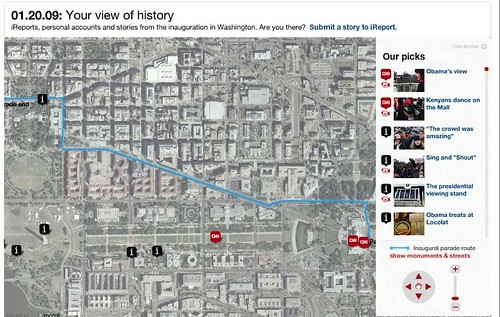 An interactive map with geo-tagged photographs is available from CNN for the inauguration events Tuesday. If you’re attending the inauguration in person, simply email your photos and videos to ireport@cnn.com and they may appear linked on the official CNN iReport website. It’s the 21st century, and anyone with a cell phone in their pocket is potentially a digital witness. For an interesting, live blogging take on Tuesday’s events in Washington D.C., check out the “Voices Without Votes” project live inauguration coverage via CoverItLive. Coverage begins at 10 am EST. Also consider following the Flickr Inauguration 2009 group photo pool.